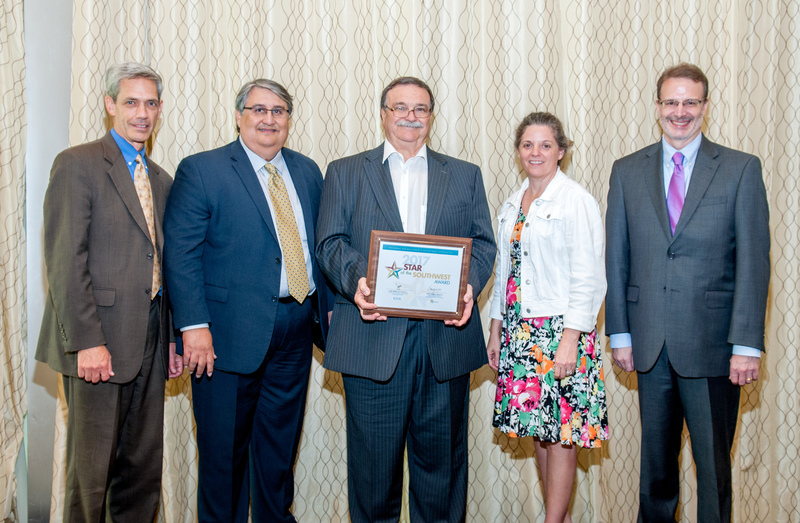 Austin, TX – The Levelland Industrial Rail Park was recognized with a 2017 Star of the Southwest Award during the Southwest Region Economic Development Association’s (SWREDA) Conference, Navigating the New Norm, in Baton Rouge, LA, on July 26. Ten projects from Arkansas, Louisiana, New Mexico, Oklahoma, and Texas were recognized for their accomplishments. All of the winning projects were funded, in part, through support from the U.S. Economic Development Administration’s (EDA) Austin regional office. The Levelland Economic Development Corporation and the City of Levelland received a grant in the amount of $3.3 million from the U.S. Economic Development Administration (EDA) to go with $5.3 million in local funds to create the rail park in 2010. Thus far the project has created or retained over 70 jobs and has generated over $25 million in private investment. SWREDA is a voluntary association of executive directors of Councils of Governments (COGs) and Economic Development Districts (EDDs) across the five-state region covered by EDA's Austin Regional office. COGs and EDDs, also known as regional councils, regional commissions, regional planning commissions, and planning districts, are regional governing and/or coordinating bodies that exist throughout the United States. They are normally controlled by their member local governments, though some states have passed laws granting them with region-wide powers over specific functions, and still other states mandate such councils. There are 59 EDA-funded EDDs in the five states. “Innovative projects across SWREDA’s five-state region have made positive impacts on the lives of residents and on the local and regional economies. We are pleased to be honoring 10 projects that have made significant strides at helping improve the quality of life for citizens in the communities they are located and serve,” said Betty Voights, SWREDA Chairperson and Executive Director of the Capital Area Council of Governments in Austin, TX. For more information about the award-winning project, contact John Clary, Director of Economic Development for the Levelland Economic Development Corporation.